We actually finished Melody's house, today, or at least the project that the Catholic diocese wanted us to finish on the house. She really could have used a new roof, but we weren't supposed to do that. So we didn't. We did have half a dozen go to her house today to finish the very last of the fascia installment and paint her front porch and a few bits of fascia that really looked a lot better for the new coat of paint. The first day the manager had said that we were not to touch the fascia on the eaves, at all; but he changed his mind on the third day of the project and told us that we were supposed to do the extra work. I suspect, somehow that it was after seeing the quality of the work we were able to do. John had me just drop everyone off at the house, but the really amusing thing was that I missed the house entirely when I first went in that direction because I couldn't recognize the house! Or at least that's what everyone said because I nearly missed the last turn entirely. I think it was because I was concentrating on a sign landmark I'd been using, but I couldn't entirely say that it wasn't because the house was so different than when we first started. The combination of all the trim and paint and everything was pretty startling. We were there for just a piece of wood, but the big, clean restrooms were kind of tempting after the far too often used ones in the convent and Melody's very, very well heated one in her house. And, knowing that I always take longer than John does, we decided to meet at the checkout counter. But on the way there I saw Clay checking out some interesting paper tape that was used for joining sheet rock without putting the mud underneath it... and it was intriguing enough that he memorized the information and held it out for me to take a picture of with my celphone. That was pretty cool. That would amuse me far too much. When I was way up in the air on the extension ladder, I was swearing quite a lot, mostly just to relieve tension when I felt afraid. I mean, I was really afraid, but I also knew that it really would be okay, as it was built to do this job safely, so when I got too afraid, I'd just swear a lot and it would get the emotional load off my chest and I could go on and just concentrate on where the brush was putting paint. John had done the bulk of the painting up there, I was just up there to take care of all the corners and details that he'd missed, so I didn't have to be up there any more time than it took to do that. It's just funny swearing that much while on a church job, but I'm sure that no one minded too much. We made it back to the house without getting into a fight or, on my part, being mistaken for a Catholic or overshooting the house again. 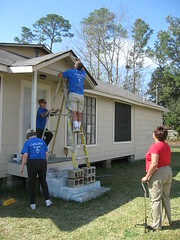 Once we got back, I helped move cinder blocks so that John could finish the porch roof, and then went to work painting with Angie and Mike. Then I helped find the wiring bundling stuff for Clay, and then ended up painting some more on the front porch. While we waited for the first coat to dry, we ate our lunches and Melody came out with two sweet potato pies! We had been planning on leaving around lunch time, and she wanted to make sure she got us something to take with us when we left! That was really, really sweet of her, and the pies were just delicious! We all snarfed slices even with paint and bug spray covered hands. She told us that she'd been planning on giving us all pressed Po Boys and fruit and salad; but she hadn't known if we were going to be able to stay. She'd been on mediations the first day, she really got to know most of us on the second day, but then, on the third day, half our crew left for another job! That had thrown her plans for a loop. Finally, we hadn't even been all that sure we'd even make it there on the fourth day. So she'd been a little anxious about doing something we hadn't planned for, but she decided to give us the pies. That was really neat. And it was even neater when I went up one last ladder to do the last of the painting on the fascia, and we were pretty much all Done, we washed all the brushes out one last time, and then headed on to the next job, which was West of Biloxi, in Gulf Port, instead of as far East as we'd been for Melody's home in Moss Point. I drove. Nearly everyone else in the car slept. So, on Wednesday, the other half of our crew had ended up working on stairs to one of the raised houses, and they'd done pretty well on it even when they'd accidentally dropped a six by six on the right hand of the one skill guy that knew how to do everything. So he's been mostly telling everyone what to do and keeping his right hand out of the way. Another crew had put the self-stick tile flooring to a house and then doing all the trim, paint, and finish work for the walls and baseboards. Now that was work I knew pretty well. We were all shipped to the latter house, which might have been something of a mistake as there were already seven people there, and add another six; and the disgruntled plummer who was the man of the Catholic pair here who said he couldn't find any fittings and then got mad at our people for the foreman telling him they were there in a paint bucket and the fact that he couldn't find it. John found it sitting right there in the bathroom, and handed it right to him before he was able to get to work. Thank God for John. I ended up doing a lot of random putty work, filling in all the finishing nail holes for the trim and baseboard. I learned from Clay how to cut one corner and gently knock off each of the fills I did instead of using sand paper only after everything was done. The sand papering meant that the boards had to be washed when everything was done to get all the dust off before the paint was applied. The walls hadn't been painted, yet, so we weren't doing the tape, caulk, paint, and peel trick I'd learned from Gabe the year before. Though I kind of wondered why we weren't doing it, but realized that the walls hasn't been painted before the caulking was being done, which would kind of account for it. I wasn't quite sure if we were supposed to be doing the painting in the house as well. The fun part, though, was getting to caulk the inside of the upper portion for a closet. The lady doing caulking wasn't able to get that far up, so she asked me for help and I was actually able to get all the way to the far upper corners as well as the edges and sides she'd asked me to do in the first place. She'd managed an overturned paint bucket for my own support on getting up there, as there were very few ladders there. It was fun to lay a perfect bead from that far away. *laughs* I'm proud of what I learned last year, really. We don't know if it was just the old wiring in the house or if it was something the volunteers had done that day. That was just really, really odd. We ended up finishing the wiring for the kitchen lights,and just left the switches as they are. They said that they had a licensed electrician that they'd send by to fix it sometime, but that we shouldn't worry about doing the bedroom lights (you can't wire up fixtures to live circuits). Finally, at 5:30 we all called it quits and headed back for showers and stuffed crab appetizers. I was so full of sweet potato pie, ice cream sticks, and those appetizers that I thought I should just skip dinner, but since I am one of the drivers, I pretty much had to go. There was a little restaurant called Aunt Jenny's that I'd seen on signs around town and Jenifer, herself, had said she'd found a review of the place that was quite good. So we went there. It was in an odd place, right before one of the huge bridges at Oceanside. It was a quaint little place and was actually called Aunt Jenny's Catfish House. It was great. They only did catfish, shrimp, and fried chicken along with three dishes that came with rice. The catfish, shrimp, or chicken were all-you-can-eat on the most part, though the shrimp had a large place option that looked pretty good, too. All the meals came with hot fresh biscuits and cole slaw. The biscuits were light, tender, perfect and they served them with an apple jelly and buttery-spread (which I didn't use with the partially hydrogenated oils) and their own Aunt Jenny's syrup. I saw a jar of it in the gift shop and it had corn syrup, sugar, and cane syrup as the ingredients. The coleslaw was crisp and cold and creamy and rather comforting in its simplicity. I could probably have just stopped with those two things and been full; but I ordered the chicken because the all-you-can-eat meal was just ten dollars, which is about what a fried chicken dinner is anyway in Colorado. And it was utterly delicious. The chicken was crisp and light and not at all greasy. It was deliciously seasoned, and my dinner came with a wing and a thigh, and I asked for another leg because it was so very good. The shrimp were covered in the same light breading and they were quite nice as well, and one of the ladies got the catfish and shared with the other and they both declared the catfish very, very fine. There was a choice of French Fries or a roasted yam, and I got a yam, and the beauty of it was that they served it with nothing at all. It was just creamy, sweet goodness on its own. John had the shrimp creole, which came in a red sauce and he liked that very much as well. We were seated at a big wooden table with an awesome view of the river right outside, though we couldn't see it at night. There was also an absolutely enormous, sprawling live oak tree right outside as well. The main trunk was bigger than most cars. John got a few pitchers and shared them. I just had water, as I wasn't up to any more calories from soft drinks. Everyone enjoyed their dinners, and we talked mostly about the various projects, so I was able to catch up up on how they were all doing. There were folks that had left the too-crowded house and went onto another house that needed painting and other things done to it, as well as the other crew on the stairs. The stairs were down to their last two steps, which is very nice, and they might well finish tomorrow. The too-crowded house didn't look like there's any way it's going to be done tomorrow, but there are so many people, it may well get quite a bit closer. 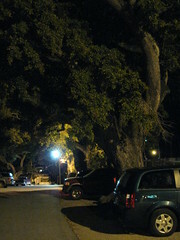 On the way out I was struck by just how many of the huge, old live oaks there were around the restaurant. They were just enormous, gnarled, and they'd survived Katrina and probably a thousand other hurricanes in their lives. So I tried a picture in the dark and it turned out all right. Everyone was pretty tired. A bunch of the younger men, including John, went off to the casino to go and gamble a bit and see things; but everyone else was so exhausted, they just wanted back in order to sleep. I'm having problems trying to get a connection tonight, for no good reason I can see, as everyone else is off the line, but I'll try in one other spot and see if there's any luck... but then I'm off to sleep, too. I got a pretty good night's sleep last night, and it would be wonderful to be able to do that again. One other lady came down with the stomach malady, so we're still debating what the cause is of the thing... and were thinking that it would spread like wildfire if it were contagious. The internet hasn't been up for most of the evening, so I may not get to post this tonight, but I thought I should write it at least, and I'll probably put pictures up on flickr when I can. Nice. It's really nice to do physical work and see the results, even if they get hidden by paint later. Yes. Or maybe especially when they're made to look as if they'd always been that way by the paint. The guy that did the piece work around the weird window loved the picture I took of that window where it looked just like a normal window with the siding right up to it. He was like, "Wow... that looks like it's always been that way, now." And he took that as the best compliment he could make for how it turned out. That was cool. Aww sweet potato pie, what a nice thing to do. Oh yum that food has me drooling. It was a very nice thing for her to do! And everyone enjoyed them very, very much.